Street Music Week 2018 Totals Are In! I want to thank each and every one of you for making the 16th Street Music Week such a joyous and successful event. We took in an incredible $29,322 in donations. It’s a tad shy of last year’s all-time record of $30,249, but who’s complaining? Even cooler is that we passed that magic Million Meal Mark, according to the 2ndHarvest formula of serving five meals for every donated dollar. Our collective 16-year total is $209,322, in fact, which amounts to 1,046,610 meals. 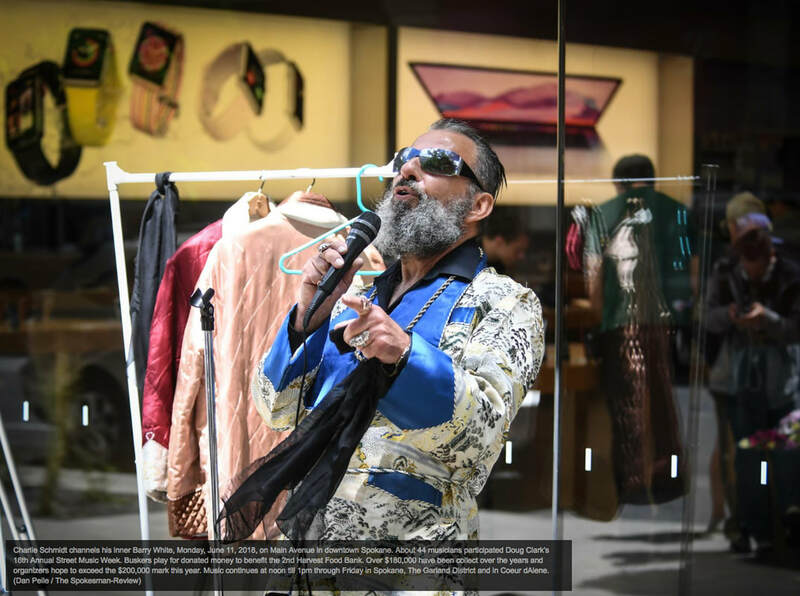 The bottom line is that this is a great and worthy event because of YOU – the hundreds of talented performers who donated your time on the sidewalks of downtown Spokane, the Garland District and Coeur d’Alene to help feed our region’s hungry. A special shout out goes to my Street Music Week crew: co-chairmen Jim Lyons and Joe Brasch; Julie Shepard-Hall, who oversees the Garland District, and Jenny Wayman, who led the effort in Coeur d’Alene. Special thanks also go to Bozzi Media for supplying this year's retro posters (designed by Charlie Schmidt); Matt Monroe who once again created and supplied all those cool busker buttons and area businessman and philanthropist John Huckabay who once again gave $15,000 for the cause. One last thing to consider. I’ve always thought that Street Music Week can be replicated in basically any city and here’s more proof. For the sixth year, the event was held in Appleton, Wis. The fundraiser began there thanks to a connection with several Spokane musicians. “We have grown each year,” said organizer Audrey Hendrickson, who added that nearly $10,000 was collected last week and given to their area’s Feeding America. ​Yes, it’s that time again. 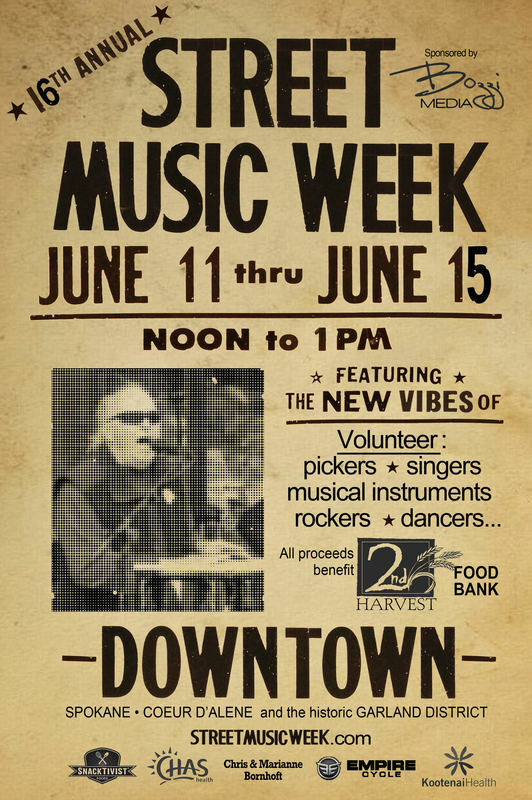 The 16th annual Street Music Week runs during the noon hours of June 11-15 (Monday through Friday) on the sidewalks of downtown Spokane, the historic Garland District and downtown Coeur d’Alene. I’d love for all of you to take part for our worthy cause. 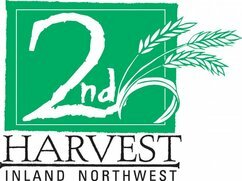 As always, every cent collected by volunteer performers goes to 2ndHarvest food bank to help feed the area’s hungry. So far, Street Music Week has collected nearly $180,000 in food bank donations and we’re hoping this year to pass the $200,000 mark. This year’s event is sponsored by Bozzi Media, which generously funded and published our Street Music poster and airs my column in Spokane Coeur d’Alene Living magazine. You veteran buskers know the drill by now, of course, but here are the details as a refresher or to pass along to any friends or newcomers who may be interested. Downtown: I'm always next to Starbucks on Main and Post. Garland District: Outside the Gathering House coffee shop at Garland and Post (kitty-corner from the Milk Bottle). Coeur d'Alene: Outside Art Spirit Gallery on Sherman Ave.
After signing in, you'll receive a busker badge that is yours to keep and a red bucket for donations. Then it’s up to you to head out and find a sidewalk spot to perform for an hour. After 1 p.m., bring whatever donations you’ve collected in your red bucket back to your check-in spot. All skill levels are welcome, too. 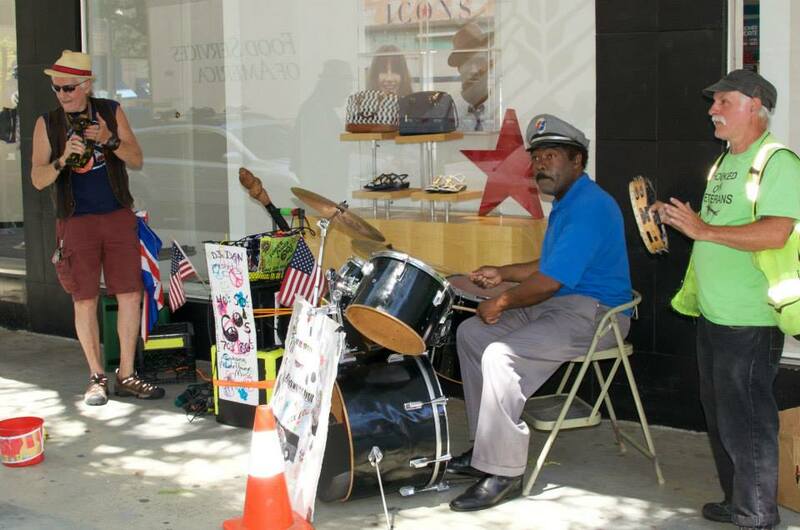 Street Music Week is about generosity, not virtuosity. Remember that there are no electrical outlets to plug in to. This is an acoustic event although battery amps are totally okay. Just keep the volume at a reasonable level. ​Feel free to email me (dougclarksville@gmail.com) with any questions or call me at 509-999-0050. And make sure and see our story at www.streetmusicweek.com. I can’t tell you how appreciative I am for all your talents and your willingness to share them. ALSO – check out and pass along the attached terrific Street Music Week Commercial that was made for us. So see you June 11-15 for the 16th annual event. We're looking forward to seeing you at the 2018 Street Music Week. 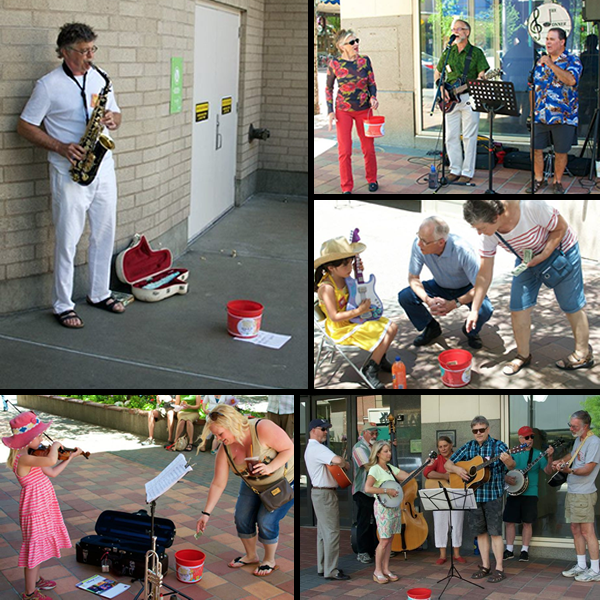 Buskers and music fans will be filling buckets with money for our Inland Northwest 2nd Harvest food bank. Join us 12 noon to 1pm during the week of June 11th-15th for music, fun and help 2nd Harvest feed hungry folks in our community. More details soon! Check out this Spokesman Review article about Myles Kennedy busking at Street Music Week! Donate today! Watch the MOVIE "Sing for Their Supper" about Street Music Week.